Club legend Mark Tyler is ready to sample the buzz of a Posh derby fixture for the first time in more than eight years. Tyler is on stand-by for a mouthwatering trip to MK Dons this Saturday after stepping in at short notice for the midweek EFL Cup exit against Swansea. The 39 year-old made a series of impressive saves against the Premier League side after being pressed into action for the first time this season following a hamstring injury to number one Ben Alnwick in the warm-up. Tyler last appeared for Posh against MK Dons back in a 2-1 home defeat in December, 2007. He had been replaced as number one by Joe Lewis by the time the two sides met again later in a League Two season in which both were promoted. 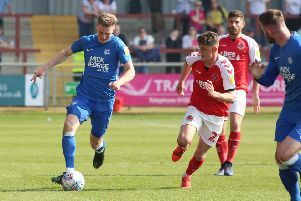 Fresh from his 490th appearance in Posh colours on Tuesday night, Tyler said: “I prepare for every game as if I’m going to play in it, so it wasn’t an issue to step in late on against Swansea. “Playing football has been my job for so many years and I love to be involved in any game, but it would be great to play in a derby. “I’ve not played in too many of the games against MK Dons and I’ve never played at stadium:mk. “As an older Posh guy, Northampton is still the main derby for me, but we also know how important it is for the fans that we get a result on Saturday. Central defender Jack Baldwin is available to return against MK Dons after sitting out the EFL Cup exit against Swansea in midweek due to suspension. Baldwin was dismissed for collecting a second caution when conceding the stoppage time penalty that led to a 2-1 defeat at Oxford United last Saturday. But boss Grant McCann said that summer signing Ryan Tafazolli faces at least another week out after a scan revealed there is still a tear in his hamstring.